As the Premier League's season pulls into the station, comparatively destitute Leicester City plays the role of the Little Engine that Could. Here in the States, Villanova took home men's college basketball's top prize without the benefit of major conference football money. 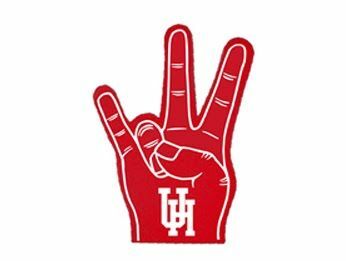 Down in East Texas, the Coogs have to be thinking: Why not us? Among the off-season musings that occupy the time until football returns is the question of whether a team from a non-auto-qualifying conference could ever play for a championship. The field has widened since the Playoff began, and this year's Houston team may have as good a chance as anyone. Since Boise State last challenged for the spot, it has become apparent that for a team from outside of the power structure to have a shot, it's a multi-year process. Houston will be building upon a strong 2015 outing and a top ten ranking, and a bowl victory over recent champion FSU doesn't hurt either. Several preseason rankings and predictions have Houston in the 7-15 range, and while these don't have any bearing on the selection committee, it gives a snapshot of the Cougars' respect in national media. Houston also hauled in the top recruiting class ever for a group of five team. The roster is, of course, full of Texas Kids™, which I'm sure also provide a perception boost. Speaking of perception, Houston is also uniquely positioned with a head coach in Herman who many believe could have had any open job in the country this past offseason. He has the clout through his connection to the first playoff national champion in Ohio State; in fact, there was UH gear on the field during the championship celebration, thanks to a smart branding decision from already-hired Herman. Lastly, while it's tough for a group of five schedule to stand up to power five scrutiny, a group from the American has as good a chance as any. If last year's conference powers hold serve, Houston will face strong squads in Navy, Memphis, and whoever emerges from the East. But perhaps most notably, in addition to an ACC squad in Louisville, their out of conference begins with an opening week "neutral" but in-town tilt with Oklahoma in Houston's NRG Stadium. If the Coogs can knock off the Sooners? Let the buzz begin.